Puppy games are a great way to teach your pet control and discipline. They're also the source of lots of fun and excitement, and can help you bond with your dog. What's not to like about that? Cool Reasons For Playing Puppy Games! Puppies may like to frolic and roll around playfully, but puppy games don't just come naturally so you'll need to teach him 'the rules of the game' and how to play. Puppy play can teach control and discipline in a way that's fun for you both and, as an added bonus, playing with your puppy can help to strengthen the bond between you and your dog. A puppy who is allowed to play (controlled) pet games regularly will develop into a well-balanced adult dog who rarely gets bored. Most of us know all too welll what a bored Cocker Spaniel can get up to! Playing puppy games helps stimulate your Cocker's metabolism. The exercise he gets from playing games can help to keep him fit and in good shape. Playing games can help with obedience training and reinforcement of your puppy's learning. Structured puppy play is also a great way of establishing and reinforcing your status as pack leader. You can use puppy games as a reward instead of treats. Rewarding your puppy with play may also help to stop those calories mounting up and making him chubby! 'Fetch It!' is one of the best puppy games you can play with your dog. I guarantee he'll love it! First, ask your puppy to 'Sit' and 'Wait'. Next, choose a toy or a ball and show it to your puppy. You can choose your own words, 'fetch it', 'fetch', 'go get it', or 'bring it'. The choice of wording is to suit you, but whatever you decide, just be sure to use it each time to help your puppy get the message. Your Cocker may instinctively run over to his toy. He may pick it up and he may even bring it back to you. If he does any of these, reward him at each stage of play to let him understand that he's getting it right. For example, praise your puppy if he moves towards the toy, if he mouths it, if he picks it up and, if he returns it to you, praise him big style! Just look at the fun this 6-month old cocker puppy is having playing fetch in the pool, once he got the hang of it. You can watch the video here. Although Cocker Spaniels are natural retrievers, you may need to work on this puppy game a little at first, so be patient! Your Cocker puppy may pick up the toy and run off with it. It's important that you don't chase him (here's why). He's also turning your games into his puppy playtime. In other words, he's calling the shots! Your puppy may pick up the toy and refuse to give it back to you, stop the game and walk away. Remove the toy when he's lost interest in it and put it away; don't let your puppy keep the toy. 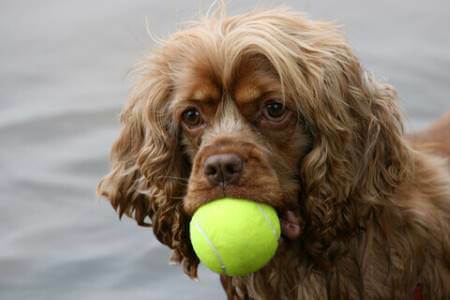 Return to the 'Drop It' command and practice until your Cocker Spaniel has fully mastered it. You can then begin again with the 'Fetch It' game. One of our kind visitors, Ajith Kumar, shares this video of his gorgeous 5-week old orange roan cocker spaniel puppy playing fetch. She's so adorable...I'm getting broody! Watch the video of Pepsi playing puppy games. I don't know of any dogs that don't like to play tug of war, but it's a game that can have a potential down side. I recommend you read the 'rules of engagement' I've listed below before you go on to the game itself. Tug of War: Rules of Engagement! Tug-of-war puppy games can be great play for puppies and dogs; teaching and reinforcing self-control and obedience, however, there are some strict rules to follow. Your puppy shouldn't be allowed to win every single tug-of-war game as winning is a sign of leadership and may encourage over-dominance in him. However, let him win some of them or he may learn that there's no point in playing and lose interest in the game. If you have a shy or nervous puppy, it may help if you let him win more often to help boost his confidence. If this puppy game brings out an aggressive side to your Cocker Spaniel, or he plays aggressively, don't play it too often. Better still, don't play at all. Find a more suitable alternative for him and move on. You must always play tug-of-war games using your rules, not your puppy's - you must control the game at all times! That said, let's begin playing tug of war! Start by asking your puppy to sit. Pick up the end of the tug rope and offer the other end to your pup. Pull gently. It should trigger a reaction in him to tug back, in the opposite direction. Let him pull on the rope a few times before asking him to 'Drop It!' When your puppy drops the rope, praise him and reward him with either another game or a treat. Tugging is a natural instinct for a dog. It's how they feed in the wild by stripping flesh from a carcass. It should be pretty instinctive for your puppy to pull and 'rag' a toy. But what if your pup doesn't seem to know what to do, or is disinterested? Try tugging gently or wriggling the rope to emulate the movement of prey. Don't pull too hard, just apply enough pressure to make him hold onto the rope. He'll soon catch on! Tug-of-war games are meant to teach your puppy self-control, so if he becomes over-excited, or begins to growl in a less than playful manner, stop the game immediately and put the rope away. This is probably not a good game for your puppy to play. Find an alternative. If your puppy refuses to drop the rope, let go of your end and walk away. Play must stop immediately. Don't praise him, and don't offer him any treats. If there's no-one holding the other end of the rope, he can't play tug-of-war! When he loses interest and drops the rope, pick it up and put it away, out of his reach. You may want to practice the 'Drop It!' exercise before you allow your puppy to play again. Find It! - Another Exciting Puppy Game! Most dogs enjoy playing 'Find It!' puppy games but your Cocker Spaniel puppy will especially love this game as he's a natural hunter and retriever! Hey Mom, look I found it! And as well as being great fun, it's a good way of using up your dog's energy, both physically and mentally. First ask your dog to 'Sit' and 'Wait'. Put a treat in your hand and let him sniff it before hiding it. Make it easy for him; let him see where you hide the treat before you ask him to 'Find It!'. When he 'finds' his treat let him have it and don't forget to praise him for getting it right. As he gets better at finding the treat make it a little more difficult for him by not letting him see where you hide it. Let him sniff it out. Later, you can begin hiding treats in another room, behind a door, or just underneath the edge of the sofa. Don't make it too difficult for him though. Don't worry if he doesn't find them quickly; the idea is to stimulate your puppy's mind and get him to work off any excess energy. Teaching your Cocker Spaniel to play puppy games will keep him occupied for ages...well, at least until you've enjoyed a quiet cuppa on your own! 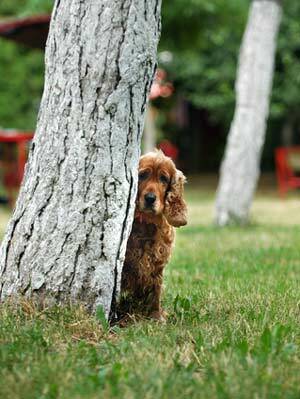 Play Hide And Seek With Your Dog! Who would have thought puppy training games would have included hide and seek? This is the same as the children's game of hide and seek but it's much more fun to play with your Cocker Spaniel puppy! Before you begin any puppy play, always ask him to 'Sit' and 'Wait'. Now, go and hide somewhere in the house. Make it easy for him at first; let him see where you 'hide'. Call him to you and wait. If he doesn't find you after a couple of minutes, call him again. When he finds you, let him have a treat and give him lot's of praise. After a couple of successful games, you can move into another room to hide - but don't make it too difficult for him just yet. It's enough at this stage that he finds which room you're in. When your puppy begins to find you easily, make the game more challenging for him by hiding behind a door or furniture in another room. Hide and seek is a good game for your puppy to play as it will teach him to respond more quickly to your recall command. 'Hide and seek' will have him (and you) tired out in no time. It's a great game to play before bedtime! General Rules Of Playing Puppy Games! You Decide When It's Playtime! Never allow your puppy to initiate play. You should control when puppy play begins and when it stops; you are the pack-leader! If you teach your puppy that he must sit and wait before he's allowed to play one of his pupy games it will not only establish that you are in control, but it will also help to reinforce your puppy's obedience training. Always stop play before your puppy becomes bored. Leave him wanting more to keep him keen! Don't let him wander off with the toy when the games are over; he should only be allowed to play with these when you say so - they are your toys! Always give instructions using a firm tone of voice to get his attention and co-operation. A high pitched, excited, squeaky voice will not establish any control. In fact, it will only serve to heighten your puppy's excitemen, which may mean he's less likely to listen to your instructions. Don't Let Him Get Too Excited! Don't over-excite your Cocker during puppy play. Over-stimulation may be caused by teasing or taunting your puppy with a toy before throwing it to him, for example, dangling the toy above his head, or hiding it behind your back. Whilst this may seem like fun, a puppy who's taught to play in this way soon becomes over-excited, which can lead to an increase in dominance; encouraging him to become more pushy, boisterous, and ultimately, very difficult to control. The only time when teasing is allowed is if your puppy is timid and shy. Teasing in this way can help to bring him 'out of his shell' and build his confidence, as well as teaching him how to play and have fun! Don't allow puppy games that involve tug-of-war with your fingers, hands, or clothing - you need to establish that you are his pack leader and not simply a member of his pack. See above 'rules of engagement'. Don't Play Chase Puppy Games! 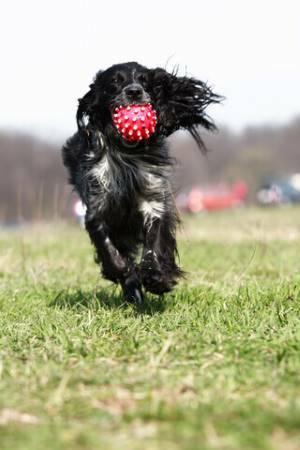 Don't chase, or play similar games, with your pup until he's fully trained - find out why here! Play-fighting is not a good game to play with your dog. That's because it teaches him that it's okay to jump up and wrestle with humans and encourages mouthing, biting, and chasing. Play-fighting puppy games can also provoke leadership challenges and encourage dominant behaviours in dogs. This can be especially dangerous in already confident, dominant dogs. Don't allow your puppy to demand your attention. If he displays attention-seeking behaviour, ignore him - attention should be given only on your terms. 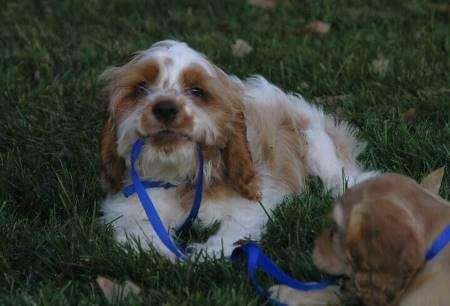 There are two different types of toys available to your Cocker Spaniel puppy. There's pacifier toys, which are toys he can chew and play with on his own, and interactive toys such as balls, ropes, and Frisbees, which are the toys he shares with you. Your puppy should be free to play with his pacifier toys, but keep the interactive toys hidden away from him. The interactive toys are those you use to initiate play. I hope you and your puppy enjoy these puppy games, but before we go, in case you've not yet discovered this for yourselves, dogs love soap bubbles! Whether they're bubbles spilling over the tub at bath time, or they're blown from the bottles of liquid bubbles you can buy for children - dogs love them! Try blowing bubbles for your Cocker Spaniel puppy and watch his expression as he chases and 'catches' his first soap bubble.